I read a lot at night. I’m not talking 8PM… I’m talking 3AM. Sometimes I get up and just cannot go back to sleep. If I don’t want to watch infomercials, I reach for my Kindle and get a few chapters in. The only problem is… turning the light on. I feel so bad for Bill but I can’t really get up right now. He’s told me time and time again that it’s OK to do whatever I need to do in the middle of the night. You see – he’s been blessed as a heavy sleeper. Lucky soul. So… I had to come up with a happy medium. How can I continue to read at night without harassing my poor man? A night light… for the KINDLE (or Nook – or whatever else you own)!!! 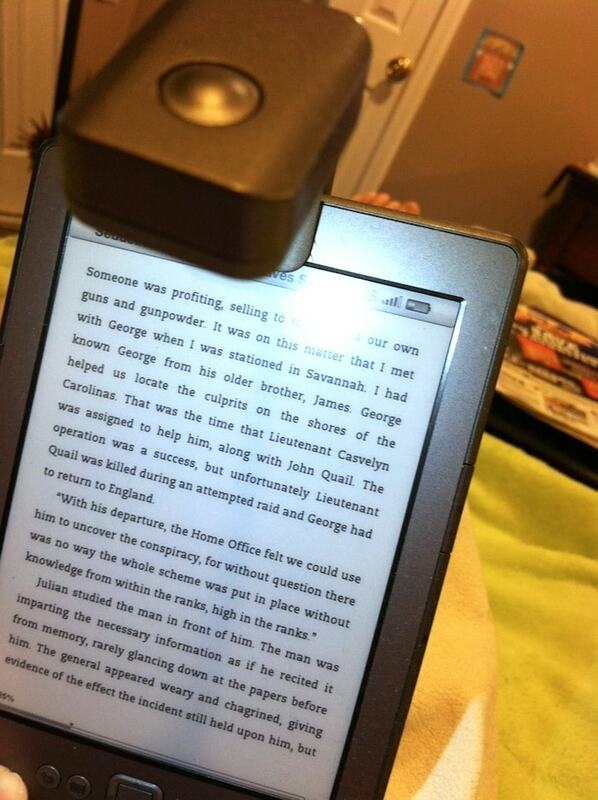 The Verso Clip-On Reading Light retails for under $20 and clips right onto the top of the device. The FLASH from my CAMERA is making that huge light on the top of my page. NOT THE Verso LIGHT. The Verso light offers exactly what I need to read in the dark. But I couldn’t photograph it properly. Trust me – it’s great. Game changer. No more guilt! I got my son a light very similar to that from B&N for a stocking stuffer. He loves it because it clips onto the rails of his loft bed. It’s so bright I decided I wanted to get one to put under my desk, where I can never see where to put my USB into my desktop PC. I think they’d probably also be good in the backseat of a car, because my trunk light isn’t very bright. Yup. I”m addicted! I read in the MIDDLE of the night too lol:) and also to help me fall asleep. I love have lights out and just my super bright kindle light on. (Clips onto my Kindle) Love it!